The word 'timely' crops up a lot in the pre-publicity for this book, and there's no denying that its underlying message has a particularly strong resonance in these early years of the 21st century. 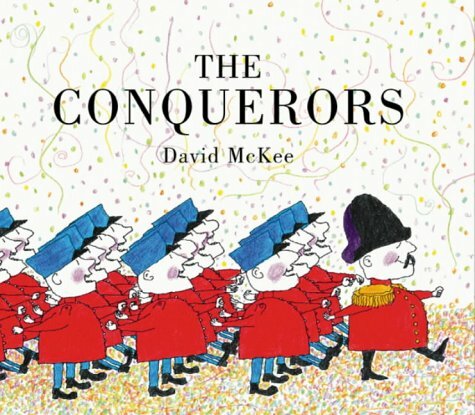 McKee's conquerors are the army of a 'large country' that habitually invades smaller territories. 'It's for their own good,' the ruling General explains, 'So they can be like us.' A small country remains the only unconquered neighbour, so small that the General has never bothered with it. To the surprise of the army, the people of the small country quietly welcome the invaders and continue to get on with their lives. The soldiers, to the annoyance of their general, spend their time playing the locals' games, eating their delicious food and sharing their wonderful stories and games. As we turn the pages we become increasingly aware of who is conquering whom. The author's sense of timing and pace make this a beautifully understated comment on a universal theme, easily avoiding the didactic, whilst effortlessly delivering the message. McKee's drawings are rooted in a tradition that flows through Andre Francois and Tomi Ungerer. It is a graphic style that eschews any semblance of technique in favour of a highly direct line that is 'coloured in' with pencil crayon in a child-like manner, allowing the white of the page to predominate. It is an approach that somehow perfectly underlines the seriousness of the message through its elegant simplicity.